Paul Scholes has revealed he was given only two hours notice to decide whether to play for England in the World Cup this summer. Scholes admits he might have said yes, but only if he had more time to make up his mind. And manager Fabio Capello delegated the job of calling Scholes to No.2 Franco Baldini. Hardly the best way to make a player feel wanted – and Scholes seems like a player who prefers the carrot to the stick. 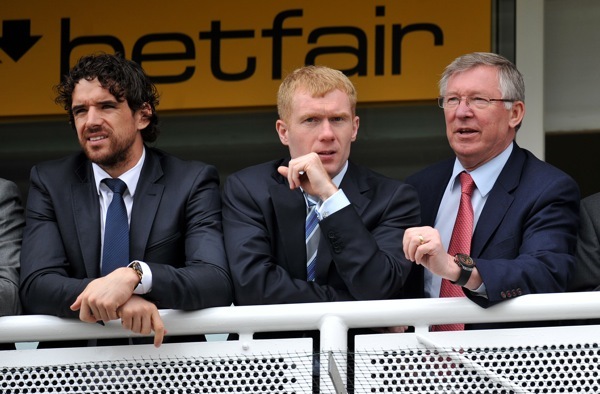 Asked if two hours was little time to make such a big decision, Scholesy said: “That’s what I thought. That’s why I probably said no, not just because he had given me a couple of hours to think about it but the fact I needed a bit more time. “I am not saying it definitely would have been (yes) in that case but I think it might have been. I did not expect it the call. It wasn’t even on my mind. “It wasn’t until a week before the tournament you start seeing all the build up and thought maybe I made the wrong decision. “I am not saying I would have made a difference. I am just saying it was a chance to play in the World Cup and I turned it down. I don’t look back and think it didn’t go well for England because I didn’t go. Maybe = yes, clearly; there are regrets there, I think. Capello faacked up on this one, proving that his man-management skills are lacking – not that I think Scholes’s presence would have made any difference to England’s fate; Capello wouldn’t have picked him to start anyway, not at first. He has no place whining. He retired. They gave him a chance, which is a damn sight more than I would have done. As for giving him “a mere” two hours to make a decision, he should consider it a luxury that he didn’t have to make it on the spot. For all Scholes has done, he has earned no favours from England, and should expect none.